Two more undefeateds went down this week, one semi-expected, one hardly expected. Louisville’s first defeat of the season was semi-expected, and for a number of reasons. For one, most of Louisville’s wins were hardly overwhelming. Moreover, their defense seemed to be increasingly under-performing during most of the season. Their average margin of victory has been only 12.8 points, including an early-season blowout over Missouri State (35-7) and last week’s blowout over Temple (45-17). Add Syracuse’s unpredictable competitiveness at home to the mix (it was their Senior Day, after all), and in the back of my mind, something was about to give. But all is not lost for the Cardinals. They are still in the running to win the Big East, and if they are able to defeat Rutgers in Piscataway on Nov. 29, they can clinch the conference total, though it nevertheless remains a relatively tall order. The same cannot be said for as-of-yesterday No. 1 Alabama going down to surprising, almost shocking defeat (almost!) at home to No. 15 – and climbing! – Texas A&M. The game already had a special feel to it regardless of the rankings, given that this was the first time the Crimson Tide was to play the Aggies since the 1968 Cotton Bowl. Even Aggie and Crimson Tide legends showed up for Week 11’s aptly-labeled “ticket to die for”, including John David Crow (the only Bear Bryant-coached Heisman Trophy winner [1957, from A&M]), and Gene Stallings, both of whom were part of Bryant’s 1954 “Junction Boys” at A&M, the latter of whom coached against Bryant in the Cotton Bowl in ’68 (Bryant for Bama, Stallings for A&M), and who later coached Alabama to its last national championship (1992-’93), before Nick Saban’s tenure. To observe the special meeting between the two teams, they even mimicked the uniform contrast of the opposing sides from roughly 44 years ago. In the 1968 Cotton Bowl match-up, Alabama showed up in all-white (helmets included) to contrast against A&M’s maroon helmets and jerseys. This time it was A&M who showed up in all-white (helmets included) to contrast Bama’s traditional crimson helmets and jerseys. At right shows Alabama vs. Texas A&M in the 1968 Cotton Bowl. The Crimson Tide showed up in all-white to contrast the Aggies’ traditional maroon uniforms. In a nod to that game from over 44 years ago, this time it was the Aggies that showed in all-white yesterday (left) to contrast Bama’s traditional crimson unis. Look carefully, and notice how little the stripes on the teams’ pants have changed in four and a half decades! The game itself, oddly enough, made things even more memorable. Before yesterday’s game commenced, Alabama’s defense only allowed an average of six points in the first quarter. In the first 15 minutes of this game, they allowed three touchdowns. Such lying down on the job is what made the game more interesting than necessary, and ended up costing Alabama the game, the top-ranking, and likely a shot at the national championship. One can quibble over whether a lapse of discipline on the part of a defensive player with 40 seconds left in the game cost Alabama just that with an offside penalty, thus giving the Aggies an automatic first down. But such a penalty would have been moot had Bama’s defense played up to its usual standards in the first half. Credit Kevin Sumlin for putting together a game plan that took the fight to the Tide in their home stadium. The new championship race: Some have speculated that Bama’s unexpected loss has, if you’ll pardon the expression, parted the Red Sea in two for Notre Dame to walk into national title discussion. I might borrow Lee Corso’s famous line of “not so fast my friend” and remind such speculators that both Oregon and Kansas State are ahead of Notre Dame in the rankings, both the AP kind and the BCS kind. The latter standings are a result of superior strength of schedule on the part of both the Ducks and the Wildcats. It shall take a loss of one of those teams – not likely, but not impossible – for Notre Dame to be legitimate contenders. The same will have to be the case for Alabama to work its way back into such discussions, now that they are behind Georgia in the USA Today Poll (@ No.5), though ahead of them in the AP Poll (@ No. 4). Not an egregious fall, but one that might be just insurmountable enough without a little outside help. Can we say “Alabama-Notre Dame in the Sugar Bowl” if these shadows remain unchanged? If nothing else, it would be another legendary match-up! Quick uniform note: TCU once had one of the nicest-looking helmets in college football. That is, until they temporarily compromised the look by succumbing to the flat, matte helmet epidemic that seems to have gripped a number of teams. Thankfully, the team has chosen to grant themselves a respite from that visual impairment disease, at least temporarily. 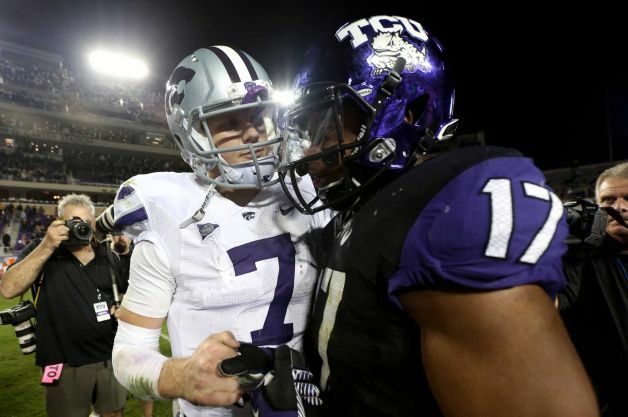 Last night in their valiant loss to Kansas State, the Horned Frogs sported helmets that closely recalled their traditional beautiful purple shells. Their helmets on TV seemed shinier than ever before; perhaps a special polish was put on the metallic purple, or, even better, they went for a chrome purple look. Whichever it was, here’s hoping they go forward with keeping this current helmet look and throw the matte shells onto the ash heap of regrettable trends.